While smoked fish is commonly associated with Scandinavian cooking, it adapts amazingly to eastern flavours. It’s strong salty flavour makes it stand up against the gentle spicing of a kedgeree, say, and the Thai pla grop (fish smoked over coconut husks) is delicious in Asian broths and stir fries. 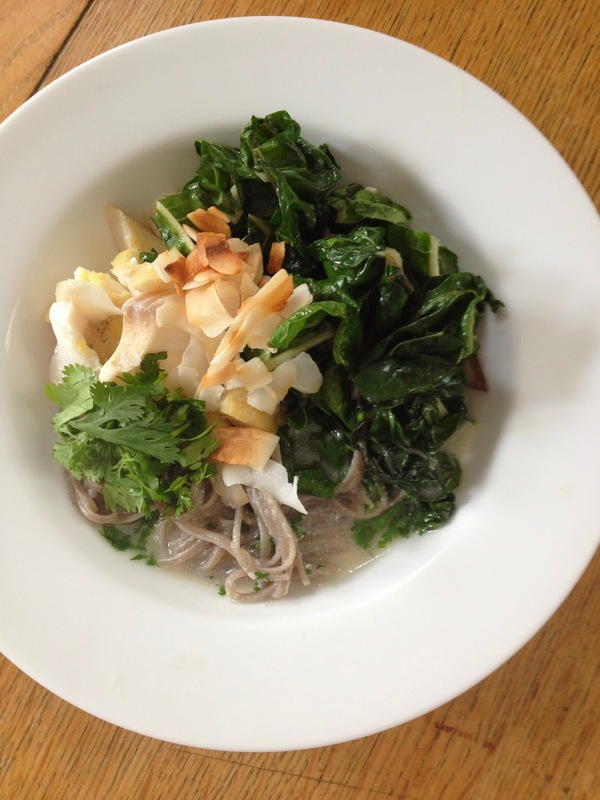 This recipe is a take on a ramen-style dish and a collation of things in my fridge. I’m mad about coconut at the moment, and poaching the fish (and cooking the noodles) in coconut milk makes it a very simple dish. With a dash of fish sauce, soy and rice wine vinegar, the poaching liquid becomes a deliciously intense broth. I added garlicky swiss chard for freshness and the toasted coconut flakes are wonderfully crunchy against the soft flakes of fish. In a saucepan bring 1x 400g can coconut milk and 400g water (or 2 sachets coconut cream with 800ml water) to a simmer. Poach 2 Smoked Haddock fillets in the liquid until opaque and cooked through (6-8 minutes). Remove from the liquid and keep warm. To the liquid, add 1 tbsp Fish Sauce, 1 tbsp Soy Sauce and 1 tbsp Rice Wine Vinegar. Taste and simmer for a few minutes or until the flavour has intensified. 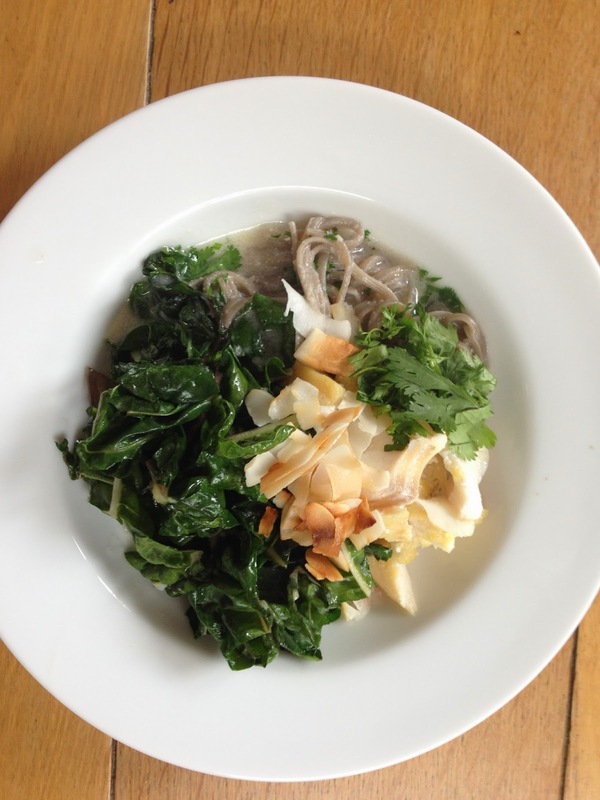 In the broth cook 200g Buckwheat Noodles until soft. Drain, reserving the broth. To this add 2 tbsp chopped Coriander and a squeeze of Lime. Keep warm. In a frying pan toast 50g Flaked Coconut. Remove the Coconut and, in the same pan, sauté 1 Garlic Clove, chopped, for a minute. Throw in 2 handfuls of roughly chopped Swiss Chard and stir fry for 5 minutes until wilted. To serve, flake the Haddock and add to a plate along with the Chard and Noodles. Ladle over the hot broth and top with the Coconut Flakes and more Coriander if liked. n.b. for a spicy version I would add some chopped Chilli and Ginger to the broth.